During a mid-winter night in 2006, shortly after Rabbi Yisroel and Shayna Freeman moved to Sudbury (outside Boston, USA) to open a Chabad centre, the rabbi woke, chilled to the bone. In the morning, he discovered he’d left their front door wide open. That open door became both a metaphor and a guiding philosophy for the co-directors of Chabad of Sudbury—about 30 minutes due west of Boston—as it has for Chabad-Lubavitch emissaries around the world. And it eventually led them to the establishment of a brand-new building, based on welcoming local Jewish residents of all ages to pray, learn and celebrate the beauty of their traditions and of Jewish history. The grand opening of the new 5,000-square-foot building, which was attended by more than 300 people, took place on Sept. 10. Guests including local politicians Carmine Gentile and Len Simon participated in the celebration and witnessed Rabbi Freeman affix a mezuzah to the main entrance. 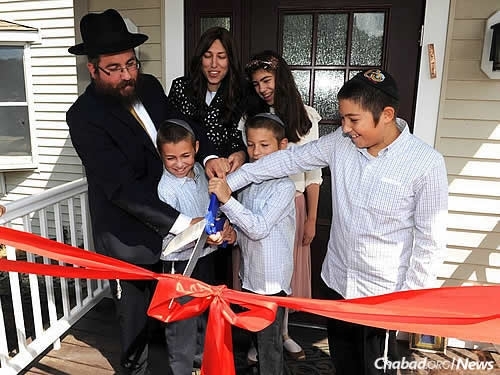 Together with his wife, 36, and four of their five children, the rabbi also cut the ceremonial ribbon, officially opening their new doors. 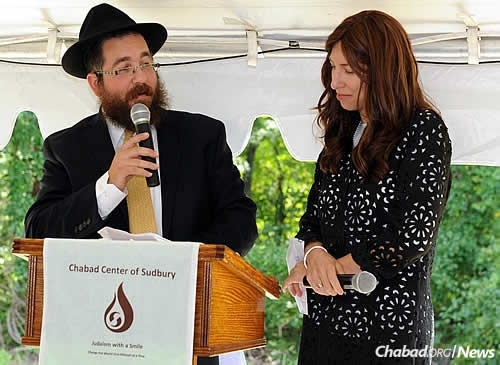 Located on two acres of land (an ideal spot for outdoor weddings and other festive celebrations), the new Chabad facility is also connected to a 54-acre nature preserve. Inside the center is a large multipurpose room, which serves as both the synagogue and the community room, in addition to a library, classrooms, offices, commercial kosher kitchen and guest suite for the visitors they expect on a regular basis. The Freemans serve an estimated 800 Jewish families in Sudbury, which has a total of approximately 5,500 households. Incorporated back in 1639, the town is home to a growing Jewish community in Boston’s far suburbs.